Future Student Scholarships - Apply Now! 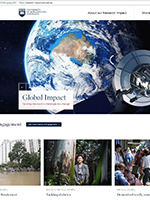 The UOW South Western Sydney campus in Liverpool is where you can earn an internationally recognised degree from one of the world's best modern universities, with undergraduate and postgraduate degrees that meet the demands of the Great South West. Programs include business, IT, international studies, law, health management and a range of double degrees. From 2019, the highly regarded UOW Bachelor of Nursing will be offered through the new Western Sydney Nursing Education and Research Centre.